Research Tuesday: What happened to my sweet child? 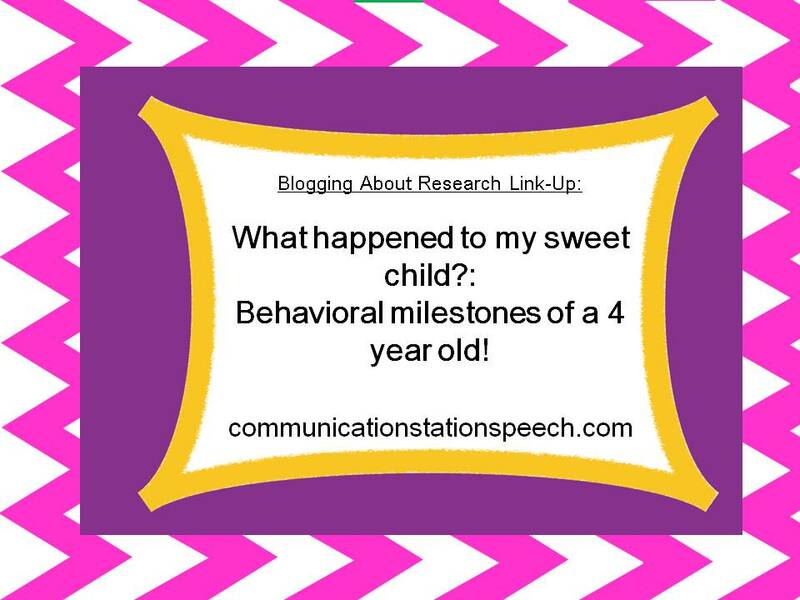 : Behavioral Milestones of a 4 year old! My son tends to show most growth (meaning most changes in cognitive, motor, social skills and yes behavior) around his birthday and half birthday each year. This is fairly standard development when researching typical development in young children. As I just finished re-researching behavioral milestones in a four year old I thought I’d share that with you today. This is for all the parents out there asking themselves “What happened to my sweet child?” or for all the SLPs working with this age group who are scratching their heads trying to figure out why their client has recently begun to but heads with their adult ideas or activities. What happened? Well the good news is, it’s simply natural development. Let’s check it out! “Your self-centered child is now figuring out that it is not always about him or her. At this age, children are starting to understand about other people’s feelings. Your 4- to 5-year-old should be better able to work through conflicts and control his or her emotions. And now you are scratching your head trying to figure out what is happening with your child/client. Why isn’t “Johnny” obeying rules? Why is he so demanding and emotional when he does not appear to be given what he wants? Does this sound more like your child/client? Well great! Because this behavior is STILL considered typical development!!! So, the moral of this blog post is to just RELAX! Don’t stress! If you begin to see these changes, a bit more sass, more bossiness, even rudeness, telling “lies” or “tall tales”, guess what? It’s actually developmental. You, of course, begin the adult must determine the best way to teach your child more appropriate forms of communication but knowing this behavior means typical development should, hopefully, at the very least, put you a ease. What did our mothers tell us growing up? “This too shall pass”? I hate to admit it but, I guess they were right! For more specific information on developmental milestones of 4-5 year olds, click on the links above. Tip Tuesday Flashback: Gingerbread Man Week!